To help budget heating costs, Dead River Company offers a range of payment options to fit with your lifestyle. EasyCAP - Dead River Company offers EasyCAP, which lets you spread your annual heating costs over predictable monthly payments. In addition, EasyCAP protects you whether fuel prices rise or fall. 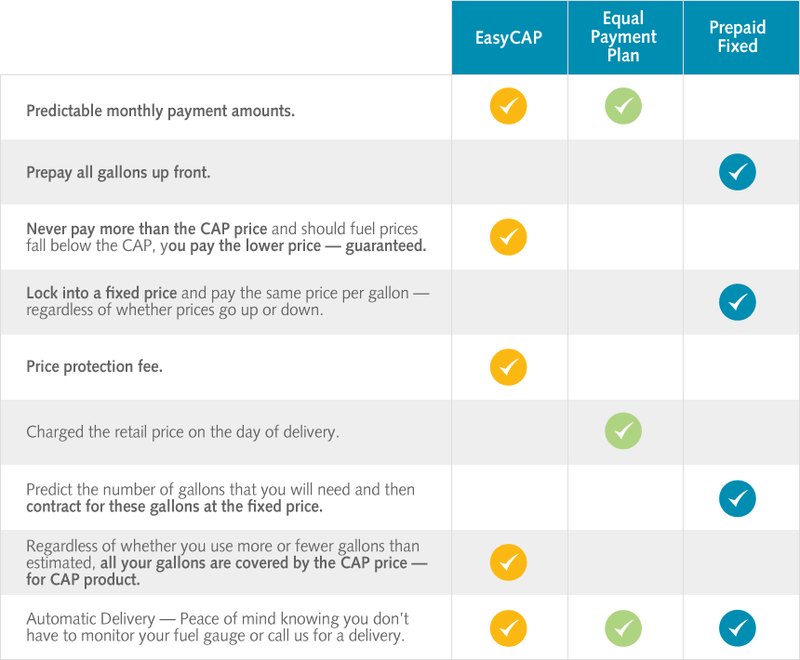 Once you enroll, your CAP price per gallon is set, which means if fuel prices rise, you never pay more than your CAP price. If prices fall, you’ll pay the lower price per gallon—guaranteed. There is a fee associated with this level of protection. The price protection fee will also be spread out and included in your monthly payments. Equal Payment Plan - Similar to EasyCAP, the Equal Payment Plan spreads your annual heating costs over predictable monthly payments, but does not offer price protection. Prepaid Fixed Price Plan - Before the heating season begins, you’ll have the option to pre-pay for the number of gallons you wish to purchase at a fixed price per gallon for the season. For each delivery, you’ll pay the same fixed price per gallon for the number of gallons purchased—regardless of whether prices go up or down. Each of our plans comes with the convenience and peace of mind of automatic delivery. The Estimator Tool is for approximate monthly EasyCAP payment calculations only. The estimated payment shown below includes the Price Protection Plan fee. To calculate your EasyCAP monthly payment, or for more information on our other Price Protection Plans, please contact your local Dead River Company office. With the convenience of Dead River Company's MyAccount service, you can set up to have your monthly payment plan amount automatically deducted from your checking account or automatically charge your debit or credit card—so you won’t have to write a check every month and mail in your payment. Dead River Company offers 30-day credit terms. Once approved, you’ll have 30 days from date of delivery or service to make your payment. To open an account, just complete the online form and our Customer Service Representative will be in touch.